Pardon Me, Madam…Is That Your Dogue? Whilst the rest of us hound dogs gear up for the DVD release of Beverly Hills Chihuahua 3, and the advance screening of Tim Burton’s Frankenweenie, Haute Dogs in New York will enjoy a night at the opera. The world premiere of Dog Days opens at the Alexander Kasser Theater on September 29th. 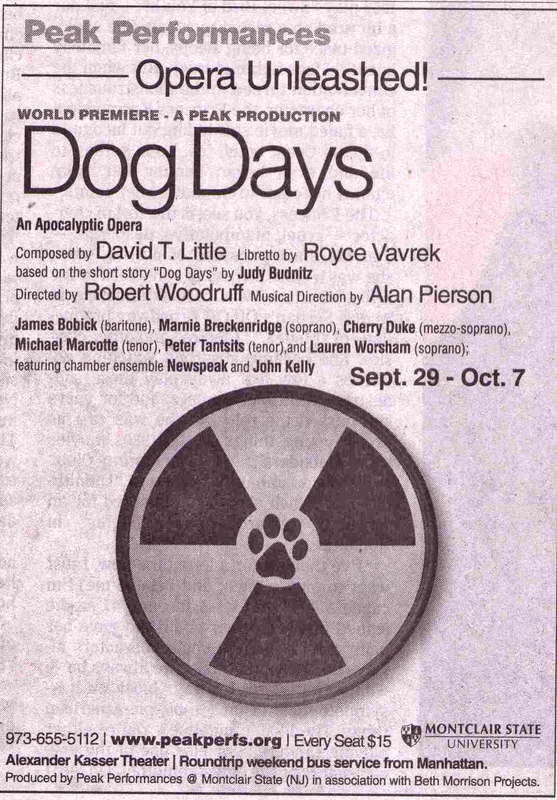 The ad for Dog Days, the opera as it appeared in The New York Times, Sunday edition. Based on the short story of the same name by Judy Budnitz, the production by Peak Performances is being billed in the New York Times as Opera Unleashed. Featuring world class vocal talent, Dog Days is a dark comedy brought to life through David T. Little’s inventive compositions of classical and contemporary music elements. The setting of the story is an apocalyptic near-future that focuses on a suburban family as they cope with the domestic complications of the United States involvement in the next world war. As hunger begins to take over, in the midst of the war-induced chaos, the family makes the acquaintance of an unusual furry friend: a man dressed as a dog, whining and begging for food. Here is an excerpt from chapter one of the book, Dog Days: The man in the dog suit whines outside the door. “Again?” sighs my mother. “Where’s my gun?” says my dad. “We’ll take care of it this time,” my older brothers say. They all go outside. We hear the shouts and the scuffle, and whimpers as he crawls away up the street. It should make for some pretty interesting opera, and leaves one wondering who will make the full length feature film? (Ellie Lee produced a short film in 2000). Maybe the actor Jason Gann will play the man in the dog suit (a la his role in FX’s Wilfred). Anyway, we’d love to hear from anyone who will be going to the opera, Dog Days which runs through October 7. Author Anna CookePosted on September 18, 2012 Categories UncategorizedTags Alexander Kasser Theater, Beverly Hills Chihuahua 3, David T. Little, Dog, Dog Days, Dog Magazine, Dogs, Ellie Lee, Florida, Florida dog, Florida Dog Magazine, Florida's top dog lifestyle magazine., Frankenweenie, fun with dogs., FX, Jason Gann, Judy Budnitz, life with dogs, lifestyle, Opera, Peak Production, The New Barker, The New Barker dog magazine., The New York Times, The_New_Barker, Tim Burton, Wilfred1 Comment on Pardon Me, Madam…Is That Your Dogue?